With over 5″ of rain in some areas of Colorado during the month of May, drought conditions have eased, especially in northeastern Colorado. That’s the good news, at least locally. The bad news? An increasing proportion of Texas is being classified as being in ‘Exceptional’ drought conditions. As seen in the figures below, according to the U.S. Drought Monitor (via NOAA’s NCDC), 4 Colorado counties that were under ‘Severe’ drought a month ago are now not designated as being in drought. And instead of being in severe drought, 8 additional CO counties are now only ‘Abnormally Dry’. Some of those counties are found in the Denver metro area and include Adams, Broomfield, Boulder, Denver, Jefferson and Arapahoe. Additionally, counties to the southeast of the Denver area are now only in ‘Moderate’ instead of ‘Severe’ drought. Unfortunately, the southeastern portion of Colorado remains in at least ‘Severe’ drought, with at least some portion of 5 counties experiencing ‘Extreme’ drought while one county (Baca) is also running into ‘Exceptional’ drought conditions. The following two figures show where more intense drought conditions have eased in the past couple of weeks. Keep in mind that in order to achieve these drought condition reductions, 1/3 of our annual average precipitation had to fall in the month of May. It is unlikely that similar above-average precipitation will occur in June. Therefore, if less than average precipitation falls, we are likely to slide back into more intense drought conditions. Figure 1 – Drought conditions for Colorado as of May 17, 2011 (2 weeks ago). 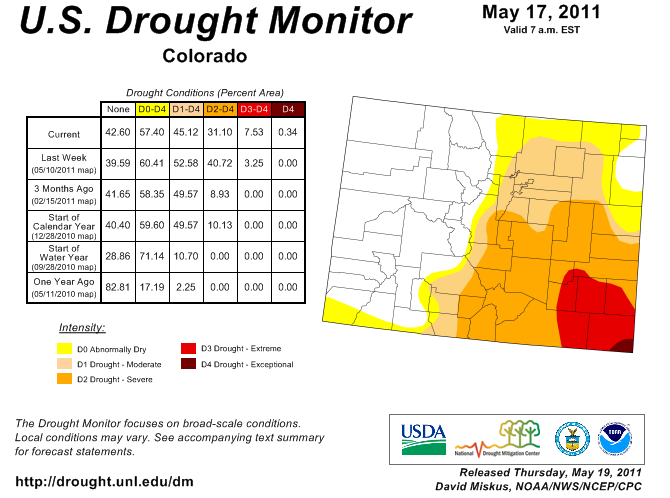 Figure 2 – Drought conditions for Colorado as of May 24, 2011 (1 week ago). Finally, a word on Texas. Instead of easing, the drought in Texas has intensified in strength and increased the areal coverage of the most intense drought condition. Again, according to the U.S. Drought Monitor, ‘Exceptional’ drought now afflicts a very significant portion of Texas. Many Texas counties are now experiencing the worst drought in modern recorded history. Crop losses are mounting and will likely top $1 Billion by the end of the year. Thousands of fires have occurred across Texas, setting records for acreage burned by this calendar date in the year. In a similar vein, widespread and intense drought is also affecting southern China. A Chinese water expert has warned the drought is a “warning signal” of negative effects to come to China’s fragile water system. 35 million people are currently affected in 5 provinces. Imagine what cascading effects will occur when that figure reaches 9 digits. Categories: environment | Tags: 2010-2011 Colorado drought, 2010-2011 Texas drought, 2011 Chinese drought, U.S. Drought Monitor | Permalink. Will The Economy Grow Or Slow? For the record, I still see a slowdown or stall this quarter and/or next. Look, either you think the economy will grow or slow this quarter. It can’t do both at the same time. Make a prediction based on what data you think you have that can support that prediction. I don’t, for instance, write that I think the next 10 years will be hotter than the last 10 in one sentence, then write that I think cooling will occur. It always amazes me how people slam climate science predictions (which have been correct more often than not, by the way) but let economists and economic commentators get away with double-speak. Economists are not infallible gods. By the way, I think I’ll listen to what Paul Krugman has to say about the potential future state of the U.S. economy. He has earned a Nobel Prize, after all. Categories: economy, meta | Tags: economy, Great Recession | Permalink. 28% of all home sales in the first quarter of 2011 were foreclosures. In a healthy economy, that number doesn’t rise above 5%. 158,434 homes in some stage of foreclosure sold in the first quarter. With around1.9 million homes remaining in foreclosure, the supply of just these types of homes will last between 2 and 3 years. If no other major economic disruptions occur in the meantime, it will only be after that time that any economic recovery from 2007 can truly occur. I’m not an economist, but I don’t see that as likely, quite frankly. Seven years after the last recession started will be a prime time for another to start. And the Federal Reserve and Treasury Department has done more to prop up billionaires than lower and middle class Americans, despite the fact that the latter sets are what actually drive the U.S. economy toward growth. Moreover, those two institutions have run out of actions they can take. Interest rates continue to hover near zero for banks (not that you and I see any tangible benefits) while trillions of dollars (literally) have been loaned to banks at those near-zero interest rates. And that’s only a couple of examples of how close to the end of the string they are. What left? Well, the government abdicated its responsibility to ensure that a large enough economic stimulus was provided in 2009. Politicians of both major parties refused to listen to economists who were experts on how we exited the Great Depression. As a result, we’re left with a tepid economy and even worse disparate wealth differences between the top and bottom than prior to 2007. I don’t see the situation improving appreciably any time soon. Categories: economy, politics | Tags: economic recovery, Federal Reserve, foreclosures, Great Recession, Treasury Department | Permalink. Even with a strong La Niña (see figure 2 below) and a slow exit from a deep solar minimum (see figure 3 below), the globally averaged temperature tied for the 4th warmest April on record, according to NASA’s GISS. At 0.55°C above the 1951-1980 average, April 2011’s warmth trails only 2005, 2007, and 2010. It tied with 2002 and just beat 1998. It is worth noting that in 2010 and 1998, strong El Niños were occurring. Such is the state of the climate having been forced by our species’ greenhouse gas pollution. April’s 0.55°C anomaly follows March’s 0.57°C anomaly. The location of warm and cool temperature anomalies across the globe has shifted somewhat from the patterns observed in 2010, as the first figure below shows. While cooler than normal temperatures have occurred over the Canadian Arctic, the Eurasian Arctic remains much warmer than normal. The broad stretch of below average temperatures across the central-eastern Pacific are the remnants of the waning La Niña. Within 3-6 months, I expect to see more areas impacted by above average temperatures as the effects of La Niña go away. And unless a major volcano event occurs within the next two years, I expect that 2012 will challenge 2010 for the warmest year on record. Figure 1 – NASA GISS‘s plots of temperature anomaly for April 2011 (top-left), Feb.-Apr. 2011 (top-right), May 2010-Apr. 2011 (bottom-left) and the GISS 12-month running mean time series dating back to 1880. The retreat from 2010’s record warmth can be seen by the latest 5 data points. 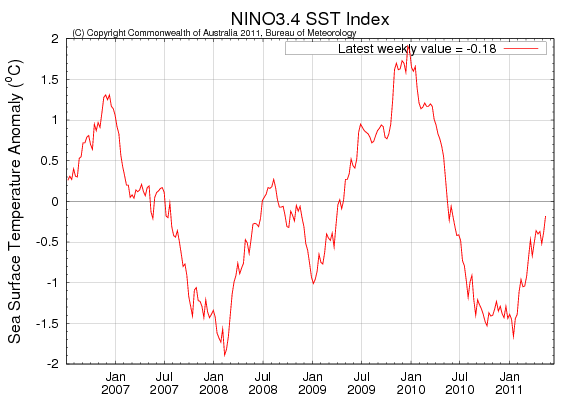 Figure 2 – Australia’s BOM time series of sea surface temperatures in the Nino3.4 region. The anomalously cool temperatures from Jul 2010 through March 2011 are indicative of La Niña conditions. Figure 3 – Physikalisch Meteorologisches Observatorium Davos, World Radiation Center‘s time series of solar irradiance through early 2011. The extended “tail” to the right of the last solar peak in 2001 represents a deep, long-lived solar minimum. Some of the Earth’s warmest annual global temperatures were recorded during this time period, which ends the silly argument that the sun alone is responsible for the warming observed on Earth. Categories: global warming, NASA, science | Tags: global warming, NASA, surface temperature | Permalink. U.K. Announces Aggressive Emissions Cuts – Will They Follow Through? Energy Secretary Chris Huhne told Parliament that Britain would reduce the emissions by about 50 percent from benchmark emission levels in 1990, part of its legally mandated commitment to reduce greenhouse gas emissions by 60 percent by 2030, and 80 percent by 2050. This news is huge. Note first the benchmark: 1990 emission levels. The U.S.’s wasted effort at a needed emissions policy change was going to use 2005 as a benchmark – which was woefully inadequate. Of course, the policy never got changed so our trial benchmark is irrelevant. What we need to know – and we obviously cannot for the time being – is whether this policy proposal will be watered down and if so by how much. No other European country has yet proposed such an aggressive cut in emissions. So while the U.K. is first and that’s a good thing because it moves the debate forward, the sorry state of politics in general likely means that the target won’t stand when put into place. But as long their efforts move actual policy forward, that’s a good thing. I just hope it’s enough and in time. Categories: environment, global warming, politics | Tags: CO2 emissions, U.K. greenhouse gas pollution | Permalink. The assassination of Osama bin Laden generated, as it should have, a considerable amount of coverage from all over the political spectrum. As the discussion progressed, but before hard-hitting questions could be explored, camps inevitably formed. From my perspective, radio and TV pundit Ed Schultz took a lead position in the “Rah-rah” camp. This group decided early on that the President and his advisors should be supported, no matter what. As long as they said things should have been done, that’s pretty much good enough for them. I don’t consider myself to be a member of this camp. I continue to have serious reservations about how the operation was carried out and worry about what kind of a precedent was set for future executives, including Barack Obama in the near future. As many know, Michael Moore and others also don’t consider themselves members of this camp. For this, they were called out by Schultz and the “Rah-rah” camp. Schultz called Moore and others who expressed their reservations “intellectual hand-wringers”. I personally found it offensive that citizens trying to demand answers from a Democratic President were insulted by a Rah-rah-er. Schultz and other so-called liberals bashed conservatives for years for falling in line behind the Bush Regime and not performing their required duties as American citizens. Categories: media, meta | Tags: assassination, constitutional authority, Ed Schultz, Osama Bin Laden, partisan cheerleading, propaganda | Permalink. One region where global warming is starting to really make its influence felt is Australia. They have experienced a deep and long drought in the past decade and what Australian officials called “biblical” floods in 2010. Those floods were caused by rains from storm systems that had passed over record warm seas. So what does the country do in response? Well, by continuing to listen to the same “free-marketeers” that sent the rest of the world into the Great Recession in 2007/2008, they decided that the greatest threat facing their country was their deficit. In so doing, they decided that cutting A$220 million from their Solar Flagships program, set up in 2009 to be able to provide 20% renewable power by 2020 would be good policy. Pay less now and guarantee that more will have to be paid later. What programs will Australia cut in the future (because we all know the rich pay too damn much in taxes already) in order to deal with worsening global warming effects because the Australians of today decided they didn’t want to have deal with it? Categories: energy, environment, global warming | Tags: Australia, global warming, global warming effects, renewable energy, Solar Flagships program | Permalink.